"The customer is not a moron. She's your wife" is a famous quotation attributed to advertising executive David Ogilvy in 1955. It subsequently appeared in his 1964 book, Confessions of an Advertising Man. 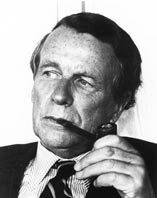 Ogilvy made his remark in response to typical advertising practices of the early 1950s, which featured loud and hectoring voices and blatantly exaggerated print. He believed that adverts should be delivered in a softer and more sympathetic tone, treating the customer as intelligent and capable of seeing through blatant hype. The quotation has since been used by others as a reminder that advertisers should not patronise their customers or doubt their intelligence, as it may harm their business. Marketing expert Austin McGhie used the quotation to show that respecting customers and overcoming their potential cynicism to a product is essential to success. He goes on to say "the customer is you", explaining that we are all capable of spotting each other's hype and disbelieving it. Business author James Leibert has used Ogilvy's quotation, adding "if we want to understand our customers, we're going to have to understand them extremely well". "The consumer is not an idiot. She’s your wife. So stop laughing." Joel Spolsky on Internet Explorer 8 beta releases. In 1990, BBC 2 broadcast a documentary Washes Whiter: She's Not a Moron—She's Your Wife that examined typical practices of advertising to women in the 1950s. In 2004, Saatchi & Saatchi CEO Kevin Roberts told the quotation to the audience at a retail conference in Fayetteville, Arkansas. In 2008, software author Joel Spolsky referred to "she's your wife" in response to complaints that a beta release of Internet Explorer 8 was "buggy" and confusing to end users despite accurately meeting HTML standards, because existing websites had been coded to work around software bugs in older releases. ^ a b Cracknell, Andrew (3 May 2012). "Ads From The Real Mad Men". The Huffington Post. Retrieved 9 January 2015. ^ Ogilvy, David (1964). Confessions of an Advertising Man. Ballantine Books. p. 96. ISBN 978-0-689-10215-8. ^ McGhie, Austin (2012). Brand is a Four Letter Word: Positioning and the Real Art of Marketing. Charleston, South Carolina: Advantage Media Group. p. 152. ISBN 978-1-599-32327-5. ^ Leibert, James (2005). Smart Business. John Wiley & Sons. p. 32. ISBN 978-1-841-12622-7. ^ a b Spolsky, Joel (2008). Joel on software further thoughts on diverse and occasionally related matters that will prove of interest to software developers, designers, and managers, and to those who, whether by good fortune or ill luck, work with them in some capacity. Berkeley, CA New York, NY: Apress Distributed to the Book trade worldwide by Springer-Verlag. p. 141. ISBN 978-1-430-20988-1. ^ Baron, Archie, Producer; Barker, Nicholas (1 April 1990). "Washes Whiter: She's Not a Moron—She's Your Wife". BBC Archive. Retrieved 9 January 2015. ^ Fishman, Charles (2006). The Wal-Mart Effect: How the World's Most Powerful Company Really Works—and How It's Transforming the American Economy. Penguin Publishing. p. 256. ISBN 978-1-101-21810-5. ^ Spolsky, Joel (17 March 2008). "Martian Headsets". Joel on Software. Retrieved 9 January 2015. This page was last edited on 26 January 2019, at 00:30 (UTC).